Participation — particularly among women — in Bloomsday is growing. Plus, d-tags and Bloomsfest. In last year’s souvenir results booklet, we noted an interesting trend among Bloomsday’s historical statistics. The number of finishers increased every single year through 1988 — rising still more to a peak of more than 56,000 finishers in 1996 — before a slow decline set in around the turn of the century. Then, beginning in 2003, the numbers flat-lined for five years at around 40,000. But the number of finishers rose by more than 3,000 in 2008, and by a couple of thousand more last year. With a comparable (and expected) increase this year, Bloomsday could approach 49,000 finishers. Bloomsday czar Don Kardong suggests two reasons: a re-jiggered finishing stretch (downhill, and closer to Riverfront Park) and timing chips, which have spread out the field and reduced traffic. There’s an entirely different statistical trend, though — the gender breakdown. In the race’s second year, 1978, only 27 percent of finishers were women. Clearly, this was a man’s foot race. For the next three years, women made up only around 35 percent of finishers. But things started to tip fast. In 1986, for the first time, Bloomsday was majority-female. Since then, women have out-finished men in every single year, cranking up the differential in almost every edition of the race. Last year, women represented 59.4 percent of finishers, to the men’s 40.6 — the biggest gender gap in race history. So why has Bloomsday become a woman’s race in the last 25 years? Kardong points out that the 60/40 ratio has become stable. He sees a couple of reasons for that. “At a given time, in the late ’70s, early ’80s, it was kind of a trend for men — ‘Let’s see if I can become a fast runner.’ And maybe that trend has softened a little,” he says. It sounds simple enough — discounting the complex, microscopic features of the little tag, and its ability to catch and fire radio waves back to the super-smart computers at the start and finish lines. It’s just a little plastic strip, after all. If fastened properly, the tag will look like a little ‘D’ relaxing on top of your shoelaces — hence its name. But the instructions for the D-tag have more “Don’ts” than “Do’s”: Do not tuck under laces. Do not form a teardrop shape. Do not leave underside rotated up. And basically, do not screw this up, or your absolutely stellar time of 33:51 will not count. The reason for the change from the well-loved anklets — which everyone simply adored for the last four years, remember? — is also simple. The anklets, to be honest, sucked. Chafed ankles, having to give them back at the end of the race, and the Velcro straps’ lack of fashion sense were just a few of the complaints. Plus, the D-tags are cheaper. So the baby capital-D is sure to be a success — that is, until next year. HOW GREEN IS YOUR BLOOM? At Bloomsday these days, people are not only concerned about the foot speed, but also the footprint — as in the carbon footprint of the massive event and how to shrink it. Race officials last year launched an effort to “green up” Bloomsday and have been assiduously expanding the concept this year. “We’ve always been concerned about what impact the organization has and the race has and we do what we can to make it as friendly to the Earth as possible,” says Steve Jones, Bloomsday’s point man for reducing waste. 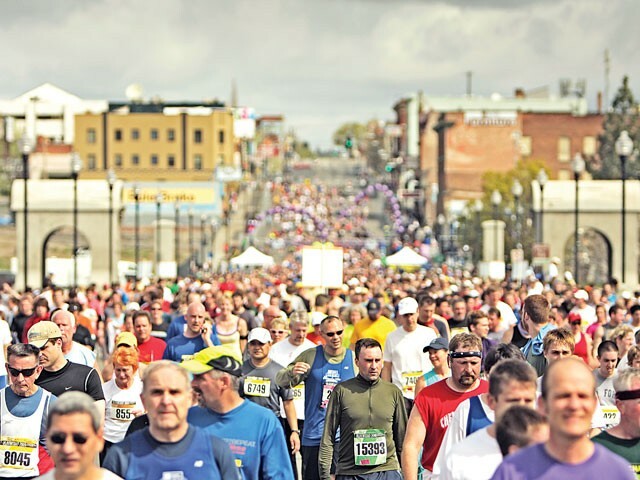 Any event the size of Bloomsday, with as many as 50,000 participants — and perhaps 50,000 more spectators and volunteers — creates any number of challenges, from parking and traffic jams to trash strewn along the 7.46-mile course. As the race grew, organizers early on had to grapple with organizing mass transit and shuttles in conjunction with Spokane Transit Authority — not to mention rapid cleanup. Bloomsday officials have stepped up their pitch for entrants to use buses or car pools or bikes to reach the event. Last year, Jones says, they experimented by sending more than a ton of water cups into the city’s greenstream for composting, diverting it away from the waste stream. The cups broke down nicely, and the plan this year is to compost even more of them. To encourage recycling, Bloomsday and Hoopfest have pitched in to purchase 300 trash receptacles that take recyclables — a way to further reduce volume in the waste stream. And, getting into the exotic reaches of greeniness, Bloomsday has calculated the carbon footprint of air travel to bring the elite runners to Spokane and has donated $600 to SNAP’s home weatherizing program in way of a carbon offset. And to make sure this is, er, running the walk and not just talking green, Bloomsday has applied for green certification from the Council for Responsible Sport, an organization seeking to make sporting events Earth-friendly. The real payoff, Jones says, is when race participants take the message home and incorporate green measures into their own lives. For the first time ever, this year Spokane’s two biggest sports institutions are joining together. The inaugural Bloomsday-Hoopfest Team Championship will test athletes’ mettle by measuring their skills in both the 12k foot race and the two-day 3-on-3 street basketball tournament. Here’s how it works. You and a team of three other participants (all the same gender) form a team and register for the BHTC. You run Bloomsday on May 2 and your times (weighted by age) will produce an overall ranking for the foot race. Come June 26, this same team will hit the blacktop in downtown Spokane, where your Bloomsday ranking will determine your place in a bracket against other BHTC teams of your gender (but not necessarily of your height or skill level, unlike in regular Hoopfest teams). At the end of two grueling days (one if you’re not good), you’ll get a ranking based on where you finished in your bracket. This will be combined with your Bloomsday ranking to produce your overall Bloomsday-Hoopfest Team Championship score. But be warned: In the event of a tie in the overall score, preference goes to the team with the higher Hoopfest ranking, meaning ballers have a slight edge in the overall competition. Back in 1977, when the Ron Burgundys of Spokane reported on the very first Bloomsday, the scope, style and angle of TV reporting was pretty different than the reporting you’ll see this year. The rise of technology has given our area newscasters more options — but the plunge in budgets has given them fewer. “This year, we’re using Droids,” KHQ News Director Jana Gray says. Turns out she’s referring to Motorola Droid phones, which will be used to stream video from race locations. Bloomsday coverage on KHQ used to run a full three hours, but now it’s cut down to one, with the other two hours running on SWX, KHQ’s digital sports and weather channel. Next year, Gray muses, the show broadcast on SWX might be extended to a full four hours. “I could see it being expanded, not cut,” Gray says. On KXLY, the ABC network bosses begin broadcasting the NBA playoffs at 9:30 am. That means their full four-hour coverage will be found on their digital KXMN channel and streamed live at KXLY.com. “Like everyone, we’ve had to tighten our belt of the past couple of years,” News Director Jerry Post says. KREM used to borrow a helicopter from fellow Belo Corporation station KING 5 in Seattle and fly over the course. But these days, a helicopter is a luxury KREM can’t afford.